MOUNT GREENWOOD — Students graduating from elementary school in the 19th Ward often consider Catholic high schools like Marist, Brother Rice and Mother McAuley or selective enrollment programs such as Jones College Prep Downtown. For many students, the local school, Morgan Park High School, isn't even a consideration. But Ald. Matt O'Shea (19th) hopes to change that, and he took a step toward improving the school Thursday through a partnership with Saint Xavier University that will allow MPHS students to earn college credit through "dual enrollment" at both schools. The collaboration works hand in hand with the "wall-to-wall" International Baccalaureate program that's set to debut at the school this fall. "It's all about perception," O'Shea said of the improvements to the high school at 1744 W. Pryor Ave.
Mayor Rahm Emanuel and Chicago Public Schools CEO Barbara Byrd-Bennett were on hand for the announcement at Saint Xavier's main campus at 3700 W 103rd St. in Mount Greenwood. 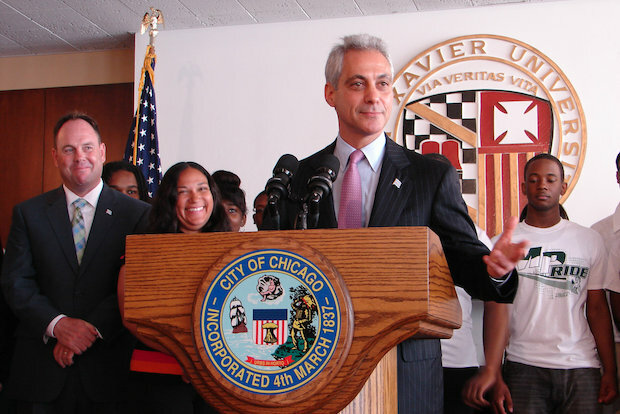 "We now have the largest International Baccalaureate program in the entire country," Emanuel said. He said the IB program was first brought to CPS after a University of Chicago study found that such programs better prepared students for college than many of the city's selective enrollment programs. "Elementary schools now want to be part of IB," Emanuel said. The IB program at MPHS is a writing-intensive curriculum that is divided into a Diploma Program, or college preparatory track, and the IBCC, which readies students for post-graduation employment. Students choose one of the two concentrations at the end of their sophomore year. The partnership with Saint Xavier will give Morgan Park students interested in attending college a first-hand look at campus life, according to the university's provost Paul DeVito. The high school students will be enrolled in both the "Focus" and "Transitions" programs on campus at SXU. These noncredit programs are offered to all incoming university freshmen and provide help with time management, study habits and research skills, DeVito said. High school students will also have the opportunity to enroll in SXU's general education classes, the entry-level courses mandatory at most colleges and universities. These "dual enrollment" courses will count for high school credit and should transfer to a college or university, DeVito said. Officials said there would be a fee associated with the program, but could not give specifics Thursday. "For something of this nature, we aren't going to charge students our full tuition rate," he said, adding a highly motivated student might be able to knock a full-semester of college courses off the books through the program. Emanuel said the seed for the partnership announced on Thursday was actually planted in May 2012. After giving the commencement speech at Morgan Park, O'Shea pulled the mayor aside and explained how the neighborhood school was being overlooked by many local families. Since then, $21 million in improvements have been dedicated to transforming the Morgan Park campus, Carolyn Epps was hired as principal in February 2013 and now the IB Program is in full swing. "This will completely change the dynamic at Morgan Park High School," O'Shea said. "It's going to be groundbreaking for the future."